The library’s workstations are in frequent use, so keeping them clean is becoming a top priority. Emory Photo/Video. 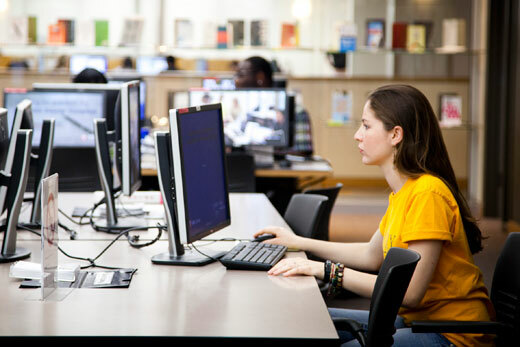 Emory Libraries is adding study space and improving its website, in response to annual survey data collected from more than 2,200 undergraduate and graduate students and faculty members. This year's survey, conducted in February, showed satisfaction mean averages higher than last year for almost all questions and user groups, says library assessment coordinator Susan Bailey. The areas where users expressed a request for improvement were library study spaces and library website (web.library.emory.edu) and search tools. Issue: Respondents requested more study spaces to accommodate varying student needs. Action: Aware of the request from past surveys, Woodruff Library opened four new group study spaces on level 1 last fall, for a total of 20 group study spaces in Woodruff Library. In Candler Library, the lobby and room 304 were renovated last summer to provide additional quiet study space, adding more than 40 seats to the third floor. Woodruff Health Sciences Center Library plans to add more group study areas with soft seating this summer, as well as adding new wired study carrels. Further research regarding group study spaces and noise levels will be conducted and addressed in the near future. "We're always looking for opportunities to create more group and individual study space in the library," says Charles Forrest, director of library facilities. "There's a constant demand for it." Issue: Library users expressed a need for a more user-friendly website and search tools. Action: Library groups are working to improve the usability of the various library resources and websites, including search functions. A comprehensive library website redesign is currently under way for Woodruff, MARBL, Business, Oxford, and the Woodruff Health Sciences Center Library, with the launch of the new websites expected in the fall. Issue: Users need books from more than one library or location. Action: Users requesting books from the offsite library storage facility can have these items shipped to their library of preference, rather than being automatically shipped to the owning library as the previous policy provided, a policy change the Emory Libraries started in January. The Libraries are exploring other options to expand delivery between main campus libraries, says head of access services Amy Boucher. Issue: Library computers are important and need to be clean and in good operating condition. Action: Weekly cleanings of the Learning Commons computers are scheduled for Woodruff Library, and the Woodruff Health Sciences Center Library will also increase the cleaning of computer keyboards. Users reported problems with the scrolling wheel on Mac mice. The issue affects machines in both the library and other public computing spaces, and staff members are working to find a solution. The results of the annual survey keep the Emory Libraries in tune with the needs of its patrons, allowing the library system to make effective changes to better serve the students and faculty at the university.